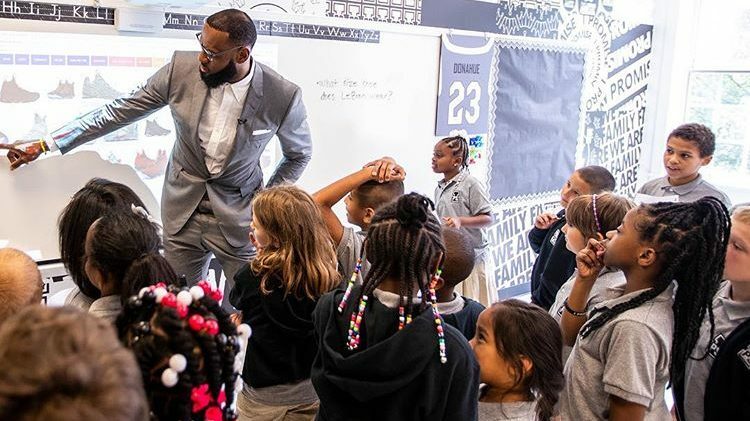 Lebron James with students at his new school. Photo: @impromiseschool on Instagram. Basketball player Lebron James recently opened his I Promise school in his hometown of Akron, Ohio in what he called the greatest moment of his career. I Promise is a public, non-charter school with a student body consisting of 240 at-risk third and fourth graders. The school offers an extended school day (9 a.m. to 5 p.m.), an extended school year (July through May), and a seven-week STEM-based summer camp. Free breakfast, lunch, and snacks are provided and students will have access to a food pantry to tide them over on nights and weekends. In a nod to James’ two-wheelin’ childhood, each student also received a free bicycle and helmet. Access to a fitness trainer is yet another bonus of being an I Promise student, as is an after-lunch “supportive circle” that helps kids transition back to schoolwork. Parents and guardians reap the benefits of I Promise, too, with GED courses and job placement. The goal is for the school to expand to serve students in first through eighth grades by 2022. Those that complete the program and graduate high school will also have their tuition to University of Akron paid by James himself. Until then, he’ll invest at least $2 million per year in the school through his Family Foundation. Now 33 years old, the new L.A. Lakers player was born to a single teen mother and raised in the inner-city community of Akron which was plagued with gun violence and drug use. As a low-income family, James and his mother moved frequently, forcing him to miss 83 days of school as a fourth grader.